Exodus is one of the metal community’s most legendary acts. The Richmond, California-based band has been making pure metal for the masses for well over three decades. In that time, the band has seen its highs and its lows, like any band out there. 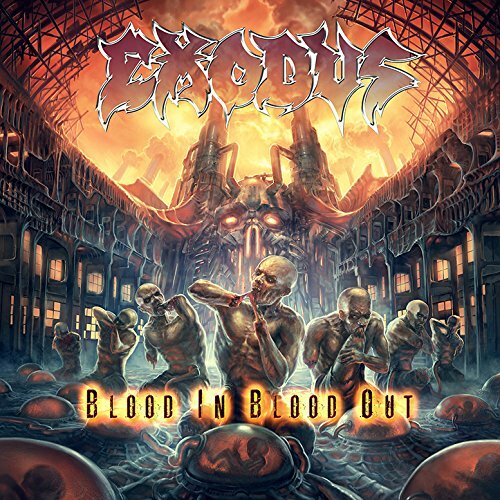 This past October, Exodus reached another high when it released its latest album Blood In, Blood Out. The album, the band’s tenth full-length studio release is arguably the band’s best work to date. One could say that that is thanks to the return of front man Steve Souza. It could also be that the band produced this album itself, essentially keeping full creative control within the band’s ranks. Regardless the end result of Blood In, Blood Out is an album that every purist thrash metal fan will thoroughly enjoy and an album that is just as deserving of a spot on this year’s list of the best new metal albums as those from Overkill, Anti-Mortem, and fellow thrash metal kings Machine Head among so many others. The album’s lead single and title track is proof of that. The song is a battle cry of sorts from the band letting audiences know in on uncertain terms that Exodus is most certainly back. ‘Collateral Damage,’ the album’s third track is more proof that Blood In, Blood Out is the band’s best work to date. It is a socio-politically charged piece that attacks those in the higher echelons of the world’s political and economic machines. On the completely opposite end of the spectrum, the band offers up a piece in ‘My Last Nerve’ that every listener will appreciate. It goes after those people that are so quick to make life miserable for everyone around them. All three of these pieces are clear examples of what makes Blood In, Blood Out Exodus’ best album to date and one of the year’s best new metal albums. If they are not enough for listeners, there is also a commentary on the inhuman acts of violence committed against innocent lives by certain Muslim extremist groups in ‘Honor Killings’ another social commentary in ‘Salt The Wound’ and even a rather interesting commentary on the atrocious acts of the BTK Killer among much more throughout this album. Again, these songs taken into consideration with the others noted here (and those not noted) result in an album that every metal purist will appreciate. It goes without saying that Blood In, Blood Out is the best work that Exodus has released in the course of its three decades-plus long life. It is a thrash record that takes audiences back to thrash metal’s heyday. That is evident right from the album’s lead single and title track. The song is the perfect lead-off for the album with the pummeling attack of drummer Tom Hunting and shredding of guitarists Gary Holt and Lee Altus. Front man Steve Souza adds his own touch with a vocal style that easily matches that of Overkill front man Bobby Ellsworth. He sings in this song, “We’re throwing down the gauntlet/Chomping at the bit/About to lay down the law/Show you all the way/Bear witness to Genesis/Of the violence the way it was back in the day/We’ve been here from the start/With a one track mind/We kept the hate alive/Always had the power/Now is zero hour/Tonight we’re gonna fight like it’s 1985.” The reference to 1985 is an obvious reference to the band’s 1985 debut record Bonded By Blood, to which many fans have compared this record stylistically speaking. It could also be argued that it’s a pun in reference to a famous Prince song. That opening verse is a statement to all of the purists and psuedo-metal bands out there that currently permeate the metal community. Souza goes on with his attack singing in the song’s chorus, “Dive in or bow out/If you have the pedigree/Welcome to the family/All in or all out/Half way, no way/Give it all you’ve got/We wrote the book so you’d better know the plot/New breed, old creed/Let’s see what you brought/This s&*$ has turned into a rout/Blood in, Blood out.” Souza and company leave nothing to doubt here. This is a full-on first salvo from Exodus in its new album. And it hits its target full force. Audiences can check out the song’s official companion video online now via YouTube at https://www.youtube.com/watch?v=6c69S3pD8qI. The official lyric video is also available online via YouTube at https://www.youtube.com/watch?v=pfu94oJ1so8. Blood In, Blood Out’s lead single and title track was the perfect choice to re-introduce the band to the metal legions around the world. It is a full-on musical assault from the band, proving right off the top why this album is the band’s best work to date. Another good example of what makes this album such a hit for fans is the album’s socio-politically charged opus ‘Collateral Damage.’ As with the album’s lead single, this piece is another excellent throwback to thrash metal’s heyday. That same dual-guitar assault coupled with Tom Hunting’s drumming and Steve Souza’s shredding vocal style drives the song from start to finish. The song’s socio-politically charged lyrics make the song even more hard-hitting. Souza sings in this song, “Blitzkrieg, insurgence/Under the thumbs of the powers that be/Conflict, tension, unlawful detention/They don’t give a f&*) about you or me/We are all just collateral damage/the s%&$ they step in on their way/Just puppets used to their advantage/To chew up and throw away.” Yet again, Souza and company leave no doubt as to the message being sent here. It’s a nice change of pace from all of the bands out there whose members love to write in metaphors, thus leaving many to misinterpret said bands’ songs. There’s just as little doubt left in the song’s closing verse as Souza sings, “Illuminati of the one percent/We chase their carrot on a string/Wall street deceit all stuck on repeat/Peons serving to the kings/To them it’s all just a natural selection/A birth right of gluttony/Like a kind of Immaculate Conception/Of inbred conformity.” Taking that verse and the song’s opening verse into consideration, it’s obvious that this song is a protest and a call to action. The band is bringing to people’s attention what is going on around us and to us as a result of the people in the world’s upper echelons of politics and economics. The band’s members are saying that people need to be aware of this and start standing up to those people and their institutions that are controlling the world. Such a powerful message set against an equally powerful musical backing makes Blood In, Blood Out even more of a hit for fans of this veteran thrash metal band. The socio-political commentary contained in ‘Collateral Damage’ and the full-on musical assault of ‘Blood In, Blood Out’ are both key examples of what makes this album Exodus’ best work to date. There is also a commentary in ‘My Last Nerve’ that will impress audiences just as much as those previously noted songs. The commentary in question goes after those people that seem to live to make the lives of everyone around them miserable. Musically speaking, this song isn’t the full throttle attack of ‘Blood In, Blood Out’ or ‘Collateral Damage.’ But even being a little bit slower, it still boasts as much power as those songs and those not noted here. Souza sings in this piece, “I’m so irritated/Being kicked to the curb/Every time you open your mouth/You try to get in the last word/Those who live in glass houses /Should not be throwing stones/It all comes crashing down/You never left well enough alone.” He goes on to sing in the song’s second verse, “So many excuses/Always laying the blame/You’re always pointing the finger/Adding fuel to the flame/Another slander, another slur/Another hollow apology/So many verbal abuses/Believe your own mythology.” These are words to which anyone can relate metalhead or not. Everyone has dealt that person or even those people who will step on everyone else to get to the top. Those that will throw others under the bus every chance they get. They are the same ones that make every excuse as to why it’s everybody else’s fault that this or that event goes awry. This is a universal topic. And the members of Exodus have handled it expertly in this song both musically and lyrically. It is just one more reason that Exodus’ fans new and old alike will enjoy Blood In, Blood Out. ‘Blood In, Blood Out,’ ‘Collateral Damage,’ and ‘My Last Nerve’ are all excellent examples of what makes Exodus’ tenth full length album well worth the listen by any metal purist. They are collectively just a sample of what makes this album so enjoyable by any purist metalhead and thrash metal fan. The politically charged attack of ‘Honor Killings’ is another example of what makes this album so hard hitting. The band tackles the atrocities committed by the various Muslim extremist groups in the Middle East against innocent lives in this song. And ‘Salt The Wound’ is lyrically along the same lines as ‘Last Nerve.’ There is even an interesting commentary on the equally atrocious acts of the BTK Killer and the shocking revelation of who turned out to be in the end. In the grand scheme of things, it is a commentary about how we as people think we know someone but in reality we really never know as much as we might think. Whether it be that song, the politically charged ‘Honor Killings,’ the social commentary of ‘Salt The Wound’ or the topics covered in the album’s other tracks, every listener will agree that every one of these songs (including those not noted) combine to make Blood In, Blood Out Exodus’ best album to date, especially when considered alongside the songs’ musical content. 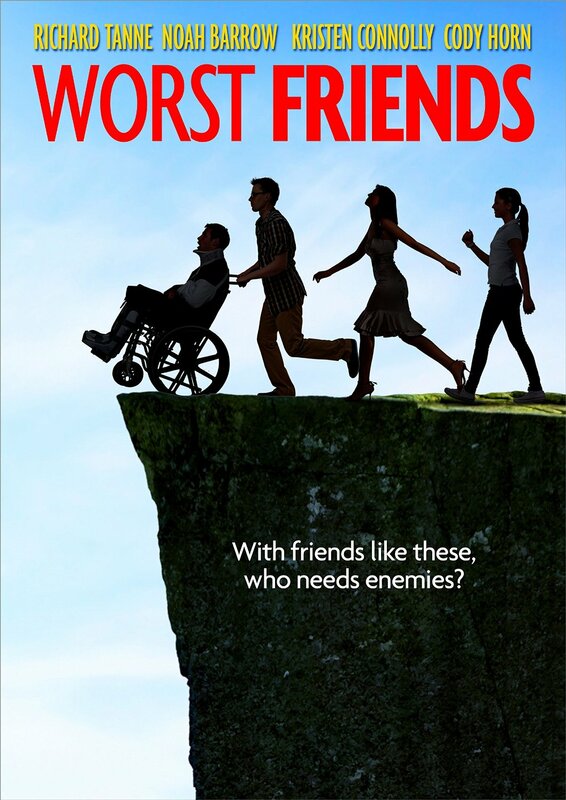 Level 33 Entertainment’s new dramedy Worst Friends is one of this year’s best new indie flicks. This movie is a surprisingly entertaining work. It is more proof that when the dust settles from Hollywood’s downfall (thanks to its insatiable desire for prequels, sequels, and remakes), the indie movie industry will still be standing strong. The main way in which it proves that is through its original script. The story behind this movie isn’t just another buddy comedy. It’s a story that is just as entertaining as it is moving. What’s more, in comparison to other buddy comedies released by other indie flicks and even other major studios, this story stands well apart from those works as its own creation. And that’s just part of what makes it work as well as it does. The story’s overall simplicity makes it even more enjoyable. There are no big sets, no unnecessary sexually driven jokes, and not even an annoying poppy song to be heard at least until the story’s final scene. The movie’s cast is one more reason that it works as well as it does. Save for actresses Kathryn Erbe and Sara Chase, most of the movie’s cast is made up of unknown actors and actresses. Even as little experience as they might have, they come across just as professional as any more seasoned actors, Erbe and Chase included. Together with the story’s overall simplicity and its largely original script, all three factors show in full once again why Worst Friends is one of this years best indie flicks and a work that anyone thirsting for a real story should see at least once. Level 33 Entertainment has released in recent years some of the best movies that most audiences have never seen. The Wedding Video, The Formula, and The Moleman of Belmont Avenue are each examples of what makes this studio one of the best in the world of indie flicks. Every one of those movies stands out from the other in its own special way. Now with Worst Friends, Level 33 has proven once more why it is deserving of that honor. One would think in looking at the movie’s synopsis that it is something of a buddy comedy, especially in partner with the movie’s box art. But the reality of the movie is that it is more drama than comedy. The movie’s original script is one that stands out not only from other movies released by Level 33 but from so many movies released by Hollywood’s “Power 5” studios–Paramount, Universal, Warner Brothers, 20th Century Fox, and Disney. It is a deep, thoughtful story that reminds us that BFF is not always the case for friends. We live, we grow, and sometimes we grow apart. Audiences will especially appreciate that writer/director Ralph Arend and his writing partners Noah Barrow and Richard Tanne don’t waste any time waxing poetic about this message. They don’t waste any time trying to set up a back story, explaining what caused the original fallout between Jake (Richard Tanne) and Sam (Noah Barrow). The trio keeps the story simple but still manages to send the story’s central message in an original manner, but not so much that it goes over the heads of its audiences. It alone makes for plenty of reason to see this movie, even if only once. It’s not the only reason to check out this movie, either. Another audiences should give this surprisingly entertaining drama is its overall simplicity. The script behind Worst Friends is the central point of the movie’s success and enjoyment. It presents a very deep story and some very deep themes in a fashion that avoids any stereotypical artsy indie indulgences. At the same time it isn’t presented in such fashion as to feel over simplified, either. It balances that serious approach with a delivery that is just simple enough to be taken seriously without feeling overly done. In other words, it isn’t so serious or simple as to make it seem stereotypically sappy or hammy. Speaking of that simplicity, the general simplicity of the movie’s other elements help to make it even more enjoyable. The sets are simple. The camera work is just as simple. There are no unnecessary sexually driven jokes. And unlike so many other movies of its ilk, this piece doesn’t torture audiences with a constant barrage of annoying pop and emo songs throughout the course of the movie. The movie’s final scene won’t be given away here. But that scene is the only one in which audiences are exposed to said musical backing. It is all kept to such a minimum that it keeps the story at the center of the movie. Arend, Tanne, and Barrow (as well as the rest of those behind the cameras) are to be highly commended for this. It makes the movie in whole that much more enjoyable for audiences. It still isn’t all that is worth considering in the movie’s success, either. One more aspect worth noting in the movie’s success is its cast. The actors and actresses that make up Worst Friends’ cast are largely unknowns. Perhaps the most well-known of the movie’s cast are actresses Kathryn Erbe (Law & Order: CI, The Mighty Ducks, What About Bob) and Sara Chase (The Other Guys, Arthur, The Little Black Book). Fellow cast mate Larry Fessenden is known for his work in the world of horror movies. But by and large the movie’s cast is made up of unknown actors and actresses. Even while most of the cast might not be known for major TV series or movies, the cast is collectively just as convincing any more well-known actors and actresses. They come across as being just as seasoned as said individuals. Audiences will see this when they watch Worst Friends for themselves. Together with the movie’s overall simplicity and the script’s originality, this last aspect shows in full once more why Worst Friends is one of this year’s best new indie flicks. It shows why it is a good watch for anyone that is tired of the seemingly endless Stream of prequels, sequels, and remakes being churned out year after year by Hollywood’s “Power 5” studios. The aspects noted here each play an important role in their own right in the success and enjoyment of Worst Friends. Given, they are important in their own right. That is not to take away from the importance of the movie’s run time. The movie runs roughly an hour and fifteen minutes. That is far below the norm of most of the big name movies churned out by Hollywood’s “Power 5” each year. Yet with such a short run time, the movie still accomplishes so much. It plays its own important role in the movie’s success and enjoyment, too. That aspect taken into account with everything else previously noted pushes Worst Friends over the top and makes this movie not just one of the year’s best new indie flicks, but potentially one of this year’s best new movies overall, too. Rory Gallagher is probably not the first name that most people would come up with when they are asked to name some of the most well-known guitarists in music’s modern history. While he may not be one of the most well-known musicians to have ever picked up a guitar, the artists with whom he recorded and performed in his short career are legendary. Muddy Waters and Jerry Lee Lewis were just a couple of acts that he recorded with during his career. He also performed and recorded with former members of the famed Yardbirds after that band’s initial disbanding. And that is just a small sampling of his achievements from his career. Now thanks to Eagle Rock Entertainment, a whole new generation of rock purists is being introduced to Gallagher’s talents thanks to the recent release of his Irish Tour ’74 archived live recording. The archived concert was released in a special deluxe 2-CD edition on October 21st. And it goes without saying that there is a lot to like about this recording especially for those that might not be so familiar with Gallagher and his body of work. The most obvious thing to like about the recording is the recording’s set list. The special double-disc CD set focuses primarily on Gallagher’s shows from Cork, Ireland on January 5th, 1974. It is a great piece of music history especially for those that aren’t so familiar with Gallagher and his body of work. The concert’s audio mix in this presentation is another aspect that audiences will like. Four decades have passed since the shows from Gallagher’s ’74 tour. And the audio has stood the test of time quite well, as audiences will note here. Rounding out the package is its companion booklet. The companion booklet comes with never before published pictures and new liner notes. Each factor noted here makes Irish Tour ’74 enjoyable in its own right. Together, they make this recording a welcome and important piece of music history. Irish-born blues-rock guitarist Rory Gallagher was one of the most well-kept secrets in the music industry during the course of his short life. He recorded roughly twelve studio albums over the course of his career. Those albums have sold well over thirty million copies worldwide. For such impressive numbers, Gallagher never gained the international super stardom of his British and American counterparts at the time. 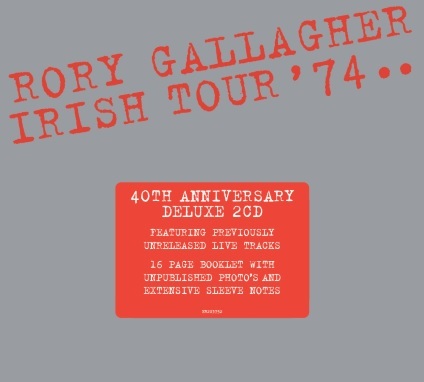 But as audiences will hear in the set list contained on Eagle Rock’s double-disc release Irish Tour ’74 Gallagher was and still is deserving of far more credit and acclaim than he has ever received. The blues rock sounds presented in the show’s set list echo hints of Led Zeppelin, The Allman Brothers Band, The Doobie Brothers, and so many other great names within rock’s blues-based sub-genre. One could even argue that there are hints of Jimi Hendrix in his playing. That is evident right off the top in his performance of ‘Messin’ With The Kid.’ Audiences can hear both Hendrix and Led Zeppelin guitarist Jimmy Page in this song. Lou Martin’s frantic work on the keyboards and Rod De’ath’s drumming set against Gallagher’s guitar playing make this song an explosive opener and an equally explosive first impression for those that are hearing Gallagher’s music for the first time. Audiences will also appreciate the comparison to George Thorogood (and to a lesser extent Lynyrd Skynrd) that can be made in ‘Hands Off.’ The song’s straight forward 4/4 blues-rock vibe will have any listener jamming out regardless of their familiarity with Gallagher’s music. The mini-tribute to the Andrews Sisters in the opening of ‘Who’s That Coming’ is by itself a great touch. The song’s simple stylistic comparison to The Allman Brothers Band and even The Doors makes the song even more enjoyable for audiences. Yes, one could even make a comparison between Gallagher and The Doors. That says quite a bit about Gallagher’s talents. Listening to the rest of the songs that make up this two-disc recording, audiences will find other comparisons. In making such comparisons, it reveals even more Gallagher’s level of talent. One can only hope that the end result will be a resurgence in the popularity of his music. The set list that makes up Irish Tour ’74 presents Gallagher as a truly talented musician. The same can be said of his band mates in these concerts. It makes one wonder why he never gained the level of fame as his counterparts despite his albums selling some thirty million copies worldwide. Perhaps this recording will help push him to that stratosphere on which his counterparts in question rest to this day. The set list itself more than makes this recording a great re-introduction to Gallagher’s works. Without a solid audio mix the recording would be nothing. Luckily though, the tapes on which these shows were originally recorded have stood the test of time quite well. The audio levels are expertly balanced in their re-mastering. The end result there is that no one part overpowers the other at any one point throughout the course of the recording. Yet again, it is proof of why Eagle Rock Entertainment remains to this day the leader in live recordings. Whether the recording be from a world renowned superstar or someone lesser known such as Gallagher, Eagle Rock Entertainment releases only the best possible recordings. It does not release recordings with inferior production values. Such expertly handled production values will make taking in Gallagher’s music all the more enjoyable and play even more of a role in re-igniting his fame. The production values of Irish Tour ’74 and the recording’s set list are both key to the overall success of this latest archived concert. The two elements together make this recording an excellent way to re-introduce Rory Gallagher to the world. The recording is rounded out with the inclusion of a companion booklet loaded with extras. The companion booklet boasts sixteen pages of previously unpublished photos from Gallagher’s Irish tour and new liner notes outlining the tour’s highlights. Among the most interesting of the liner notes are notes concerning his performance in the worn torn region of Belfast. There are notes about his impact on that region and his influence as a musician overall during his career and much more included in the liner notes. It is one more important piece of the whole that makes Irish Tour ’74 such a wonderful re-introduction for Gallagher to the world. Together with the show’s set list and its exception production values, it becomes all the more valuable for any rock and roll purist and fan of classic rock. It becomes a recording that regardless of one’s familiarity with Gallagher and his body of work, any rock purist will enjoy. It could even lead said purists to become new fans or new fans again of Rory Gallagher. All That Remains don’t have long to wait for the band’s new album. The band recently announced that The Order of Things, its seventh full-length studio recording, will be released February 24th via Razor & Tie Records. Audiences can get a hint of what’s to come right now as the band has leaked one of the album’s songs online already. Fans can check out ‘No Knock’ online now via the band’s official website. The band has tapped Josh Wilbur to man the boards for this record. Having Wilbur on board to produce the record means that most of the recording process will take place in Massachusetts, while the fine tuning will be done in Los Angeles. Wilbur’s credits include albums from the likes of Lamb of God, Gojira, and Hatebreed. ATR’s most recent album was 2012’s A War You Cannot Win. The album debuted at #13 on the Billboard Top 200. It garnered two hit singles–‘Stand Up’ and ‘What If I Was Nothing.’ ‘Stand Up’ made its way to the #1 spot on the Active Rock radio chart. That was a first for the band. ‘What If I Was Nothing’ was close behind, making its way all the way to the #2 spot on the same chart. The world stopped this year to mark two of the most important dates in not only military history but in the history of the world. Those two dates are June 28th, 1914 and September 1st, 1939. On June 28th, 1914, Archduke Ferdinand of Austria was assassinated by a Serbian nationalist in Sarajevo, Bosnia, leading to the start of what is today known as WWI. This past June marked the one hundredth anniversary of that fateful event. And seventy-five years ago on September 1st, 1939, Hitler and the Nazi forces invaded Poland. That invasion was the beginning of what would eventually become World War II. As a way to recognize those anniversaries, History Channel released a new pair of documentaries this year in the forms of 100 Years of WWI and 75 Years of WWII. These two documentaries are the latest in a long series of WWI and WWII-centered features that History Channel started releasing five years ago in 2009. Five years ago, History Channel released Patton 360 to the masses. That presentation was followed up with a number of documentaries that ultimately culminated this week with the release of The Definitive WWI & WWII Collection. This brand new twenty-disc collection culls together Patton 360 with six previously released WWI and WWII-centered documentaries for a collection that more than deserves its title. That collection of documentaries is the center of the set’s success and enjoyment. The breadth of information shared throughout the course of those programs makes the collection even more worth the watch by any history buff and specifically military history buff. Completing the box set is its packaging. Considering that the set is spread across a total of twenty-discs, one might think the box would be rather bulky. The reality is that History Channel has done quite the impressive job of packing the set without making it too bulky. That will be discussed later. But together with the collection of documentaries and their collective information, it helps make The Definitive WWI & WWII Collection a *ahem* definite must have for any history buff and military history buff. History Channel’s new multi-disc collection of WWI and WWII documentaries that is The Definitive WWI & WWII Collection is a must have for any true history buff and military history buff specifically. The main reason for this is the mass of material that makes up the box set. No fewer than seven different programs centered on WWI and WWII (mainly on WWII) make up the total of the collection. Those programs are: WWII in HD, WWII From Space, 100 Years of WWI, 75 Years of WWII, The Color of War, Patton 360, and History’s most recent mini-series/documentary The World Wars. Each program is presented in its entirety. The catch is that the discs have been scattered through the two boxes for some reason. It’s possible that the reason for that is an attempt to correlate the topics covered in each disc. That would be the most feasible explanation. So audiences should expect that ahead of time. It doesn’t mean that audiences can’t re-arrange the discs together. But each series and program is presented in its entirety regardless. And that in itself is itself a huge bonus for any lover of history and military history. It offers a total of nearly forty-five hours of content that is just as useful in the classroom as the living room. That’s about a whole year’s worth of military history, just putting it into perspective. That mass of material is in itself another reason that lovers of history and military history specifically will appreciate this brand new box set. History Channel offers in The Definitive WWI & WWII Collection nearly forty-five hours of content. That is a lot of content. The content specifically covers so many different angles of World War I and II. Audiences learn in 100 Years of WWI how simple farm machinery was the basis for the very first tanks. They also learn about the dangers and effects of chemical warfare on both sides as said warfare was developed. It definitely was anything but perfect at that point. The WWII-centered programs and documentaries are just as enjoyable. WWII in HD is one of the most in-depth programs centered on WWII that has been released in at least the last ten years. It covers WWII from every possible angle, including first-hand accounts from documents written by those that were swept up in the war. The Color of War is a good complimentary piece to WWII in HD as it focuses mainly on the color footage that was available from WWII. Patton 360 is just one part of History’s WWII 360. It offers audiences a look not just at Patton but at his adversaries and what made them such tough opponents. And then for those that want something a little different, The World Wars mixes elements of actual history with something akin to a movie for a piece that is in itself one of this year’s best new documentaries. There is so much more that could be noted in terms of what is made available content-wise. But that would take far too long. Needless to say, the amount of content made available across these twenty discs is roughly the equivalent of a small library of books on WWI and WWII. It is likely more than enough for an entire academic year or even a single collegiate semester. For those watching at home, it is material that can be visited and re-visited at any point any time one has to turn it off. There is just so much to take in. And every bit of it is well worth taking in, too. It’s one more reason that any lover of history, and more specifically military history, will appreciate and enjoy this brand new box set. 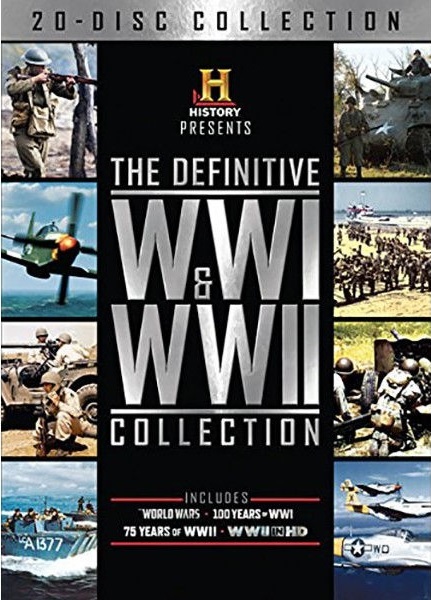 The inclusion of seven full-length programs to make up The Definitive WWI & WWII Collection is by itself good reason for audiences to check out this box set. The sheer breadth of material and its depth makes the set in whole even more worth the watch. Making The Definitive WWI & WWII Collection a home run is its packaging. One would think that twenty discs in one box set would make said box set pretty bulky. However, History Channel has pleasantly surprised with this box set. The set is broken up into two separate cases with ten discs each inside. Both boxes see one disc placed on a spindle on the inside front of the case, another on the rear inside, and eight discs spread across four separate “leaves.” The discs in question are placed on either side of each “leaf.” This method of packaging both saves space and it protects the discs from one another. Protecting the discs from one another means increasing the life of the discs, and in turn the enjoyment of each disc. The packaging in whole will save space on any viewer’s DVD rack. By comparison to the bulky box sets released by other companies this year and in previous years, audiences will see a positive difference between said box sets and this one. Together with the previously noted content and the number of programs offered through this box set, this packaging makes The Definitive WWI & WWII Collection complete. It makes one hundred percent clear just why any lover of history or military history specifically will enjoy and appreciate it. It makes clear why it is a valid contender for a spot on any critic’s list of this year’s best new box sets overall. Veteran actor Alan Young celebrated his 95th birthday last Wednesday, November 19th. For those that might not know, Young is best known for playing architect Wilbur Post in the beloved 1960s sitcom Mr. Ed. And on Tuesday, December 9th, fans of the classic series will receive a special belated gift celebrating Young’s birthday in the form of Mr. Ed: The Complete Series. Shout! Factory’s upcoming box set marks the culmination of what started roughly five years ago with the release of Mr. Ed: Season 1. It also marks the first time that the complete series has ever been released in one collection in any format. And that is just the beginning of what makes this box set well worth the price and the space on any classic TV fan’s DVD rack. Whether or not audiences are familiar with Mr. Ed, audiences will agree that more than anything else the writing in this series is a prime example of what once made television so great. It is also an example of what once made sitcoms in general great. The bonus features that were added to the box are just as welcome. And of course, one would be remiss to ignore the quality of the footage itself. Each aspect plays its own important role to the whole presentation. Each aspect combined with the other makes Mr. Ed: The Complete Series one of this year’s best new box set for grown-ups and the family in whole if not the best new box set overall. Nearly five decades have passed since Mr. Ed aired its last episode; forty-eight years to be exact. That episode, “Ed Goes to College,” aired on February 6th, 1966. Since that time, the series hass run in synidcation on a variety of networks. One of its best runs was on Nickelodeon in the late 80s and early 90s. That was long before TV Land had become its own network. It currently runs on Antenna TV as part of the network’s weekend programming lineup. 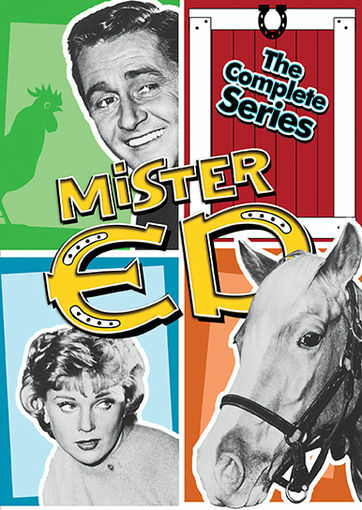 Throughout all of the syndicated runs on various networks and its current run on Antenna TV, Mr. Ed has never gotten a proper full release whether on VHS or DVD. Now thanks to Shout! Factory the prayers of Mr. Ed fans everywhere have been answered. Shout! Factory’s upcoming complete series release of Mr. Ed marks the first time that this classic CBS hit has ever gotten a full, proper release in any format. That its upcoming complete series set will be the first ever for the series is more than enough reason for any fan of the show to add this box set to their collection. Far too often, movies and TV shows are released, re-issued and sometimes re-issued again with litle to nothing different from said releases and re-issues from one to the next. It makes them worth purchasing only for those that don’t already own said titles from one release to the next. This release is worth picking up for every fan since until now, only the first five seasons have been released. And even they have not been easy to find. This box set will likely be just as difficult to find after a certain amount of time. That makes thisfirst-ever release all the more worth purchasing upon its release. It’s not all that audiences will appreciate about this box set, either. The very fact that Shout! Factory will release Mr. Ed in its complete six-season run next month is in itself more than enough reason for fans of this classic to pick up the box set. That’s because its release will mark the first time ever that the series will have been released in its entirety in one complete collection. Examining this upcoming release a little closer, another reason that audiences will appreciate this box set is the series’ writing. In comparison to the sitcoms that dominate the television spectrum today, the writing behind Mr. Ed is actually family friendly for the most part. The jokes and stories were obviously aimed more at grown-ups. But it was still tame enough that even children could enjoy the show if only for Wilbur and Ed’s antics. While younger audiences will enjoy their antics and the show’s physical comedy, grown-ups will enjoy the classic story lines. From Ed helping Wilbur get a construction contract to making another man think his wife is having an affair with Wilbur to winning himself a television on a radio game show and much more, Ed is either helping Wilbur, getting him in trouble, or getting him out of the messes that he himself makes. The formula is one that sadly, writers have long since abandoned. It’s just classic feel good buddy comedy writing that the world needs more than ever today. And audiences will agree in watching any of the episodes from this classic series just how welcome a return that formula is in comparison to the sophomoric, over sexed series that call themselves comedies today. Whether it be the series’ first season, its sixth, or those in between, every season more than proves that argument. The writing behind Mr. Ed is the polar opposite of that behind every one of today’s sitcoms. While it is aimed more at grown-ups, the comedy is tame enough for grown-ups and younger audiences alike. The fact that audiences will be able to enjoy this largely family friendly brand of comedy in its entirety for the first time makes this set even more worth the purchase. The companion interviews and commentary included with the set are just as important as those aspects to the overall presentation that is Mr. Ed: The Complete Series. Right off the top, audiences are treated to the pilot episode to Mr. Ed complete with bonus commentary from Alan Young and co-star Connie Hines. Audiences get some interesting insight in the bonus commentary including the real name of the horse that played Mr. Ed. That name won’t be given away for the sake of those that don’t yet know the horse’sname. There are also two bonus radio interviews and an extended interview with Alan Young and Connie Hines that explains the rise and fall of the show over the course of its six seasons. Audiences will be interested to learn that Studabaker originally wanted to sponsor the series but then gave in to pressure before an employee of CBS brokered a deal that would bring Mr. Ed to CBS for the course of its six-season run. That and much more is offered throughout each of the interviews and the bonus commentary. And together with the aforementioned factors, it makes this box set even more deserving of the top spot on any critic’s list of the year’s best new box sets for grown-ups and families alike. The bonus material included in as part of Mr. Ed: The Complete Series, the series’ writing, and the fact that the series has never been released in its entirety until now collectively make this box set far more than deserving of the top sopt on any critic’s list of the year’s best new box sets for grown-ups and families alike. For all of those positives, the box set would be nothing without quality footage. And quality footage is exactly what audiences get from every last episode fromSeason 1 to season 6. Since Shout! Factory had already released the series’ first five seasons prior to this box set, all that had to be done was to take those transfers and put them in new boxes. The next step was to transfer the original masters for Season 6 onto DVD and the process was done. The end result is six seasons that look just as good today as they did so long ago both in their original broadcasts and their syndicated re-airings. It pushes this box set over the top and makes it without a shadow of a doubt, the best new box set for grown-ups and families alike and a viable candidate for the best new box set of the year overall. This past October, Paramount Pictures re-issued the 1942 holiday classic Holiday Inn on Blu-ray. It marked the first time ever that the movie, which starred legendary actor Bing Crosby, had seen the light of day on Blu-ray. Fittingly, PBS will release a new episode of its hit biography series American Masters featuring Crosby next Tuesday, December 2nd. While not necessarily a companion to Paramount’s recent BD re-issue of Holiday Inn, the timing of the two releases makes them a perfect pair. Whether before taking in Holiday Inn or after, audiences will find plenty to like about American Masters: Bing Crosby Rediscovered. The most enjoyable aspect of this new DVD is the fact that it isn’t just another typical video documentary of a celebrity. It doesn’t follow that standard formula of life to death that so many bios use in their presentations. Rather it focuses on Crosby the man, the myth, and the legend. This includes the good, the bad, and the downright ugly. The fact that American Masters: Bing Crosby Rediscovered isn’t another standard bio is just part of what audiences will enjoy about this new documentary. The use of actual vintage footage and pictures from Crosby’s career and personal life as part of the discussion on both parts of his life makes the presentation even more enjoyable. And last but hardly least worth noting is the inclusion of interviews with those that knew him best including his own wife as well as famed biographer Gary Giddens and fellow jazz legend Tony Bennett among others. Each aspect by itself makes this episode of American Masters well worth the watch. Collectively, they show once again why PBS remains the last bastion of truly worthwhile programming today. PBS will release another new episode of its hit bio series American Masters next Tuesday, December 2nd. The upcoming release focuses on legendary entertainer Bing Crosby. Just as with all of PBS’ other series (both domestic and imported), it is more proof of why PBS stands as the last bastion of truly worthwhile programming. 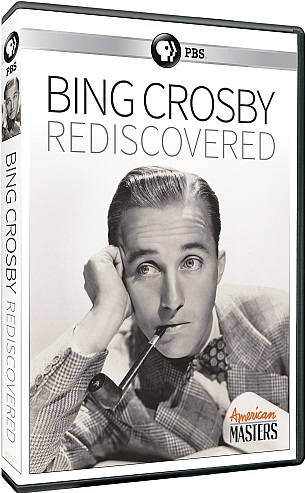 Audiences that are not so familiar with the life and times of Bing Crosby will appreciate first and foremost in this DVD the depth of information shared throughout the course of its roughly ninety-minute run time. The bio presented here isn’t the standard formulaic bio presented so often by other networks and filmmakers. It’s a fully unbiased bio that presents Bing Crosby the man, the myth, and the legend. It presents his good side and his bad. From his superstardom to his alcoholism and womanizing to his working relationship with fellow entertainer Bob Hope in the famed “Road To…” movies (apparently the duo spent nearly no time together off-screen), audiences see every angle of Crosby’s life. Audiences learn that he was hardly the easiest person to work with when it came to recording songs. And sometimes, he was just as tough to work with in live settings. Also included is the downright ugly part of his family’s life in which two of his sons took their own lives. There is much more information shared throughout the course of the program that many might never have known. For those that have always known one thing or another about Bing Crosby the entertainer or Bing Crosby the man, the information contained within this program completes the picture of the legendary figure’s history. It proves to be the fullest picture that audiences can get in regards to Crosby’s life. And in turn it proves once more why American Masters is such an important part of the whole that is PBS. American Masters: Bing Crosby Rediscovered offers to audiences what is one of the most complete portraits of the legendary entertainer that audiences will find to date. As with the series’ previous portraits, it far outperforms any celebrity profile presented by any other major network past or present. The amount of information provided throughout the course of the documentary is just one reason that the program in whole is so impressive. The vintage video and photographs that are included with the breadth of information on Crosby and his life enhances the viewing experience even more. Audiences get to see pictures of Crosby with his family away from the bright lights of Hollywood. They get to also see snippets of his famed “Road To…” movies and much more. The combination of these elements and the story of Crosby’s life in and out of the limelight makes the overall content of this program all the more important to its enjoyment. It collectively shows once again why American Masters outperforms any celebrity-based series on any major broadcast and cable network today. The combination of vintage footage and photos and in-depth story of Crosby’s life used in American Masters: Bing Crosby Rediscovered make this feature more than worth the watch. The bonus videos and interviews that come as companion material make the overall presentation even more enjoyable for audiences. Viewers learn from director Robert Trachtenberg that he worked directly with the estate of Bing Crosby to bring the documentary to life. Trachtenberg and others note Crosby’s hard work ethic and his humility among so much more. There is also a full clip of Crosby performing with his sons later in his life. The clip in question is presented only in part during the primary presentation. So audiences actually get to see the full performance in this clip in question. It’s a truly moving moment taking into consideration the story of what happened to two of his sons later in their lives. And along with the bonus interviews, it becomes one more welcome addition to American Masters: Bing Crosby Rediscovered that makes the presentation in whole a piece that any Crosby aficionado will enjoy.